Llandough was one of the most important (and stressful!) excavations in our history. In 1994 we commenced excavations on a housing scheme next to the church of St Dochdwy in Llandough, a small village on the outskirts of Cardiff. Initial expectations were not high as the area had previously been occupied by farm buildings. It was much to our amazement therefore that as the topsoil was stripped human burials began to be revealed; at first just as few, but as the development proceeded more and more. In the end just over 1,000 burials were excavated, and finds of imported pottery from the Mediterranean showed that these dated not to the post-medieval period as first thought, but to the post-Roman era (5th to 6th century AD). What was originally planned to be a three week dig ended up taking 6 months, but the results were worth it. We had found the largest early Christian monastic cemetery in Wales. Radiocarbon dating showed that the cemetery carried on in use until the late 10th or 11th century when we know from historical sources that the monastery, which was on the same site as the present church, was disbanded. Careful analysis of the human bones showed that women and children were well represented; this was therefore not a cemetery exclusively for the use of the monks at the monastery, but may also have included their families (Welsh monks could marry at this time) as well some members of the lay aristocracy (who could be buried at a monastery if they paid money). 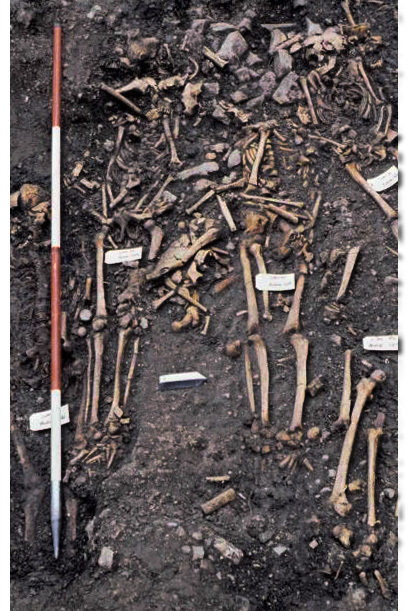 The burials showed lower levels of disease and greater life expectancy than found at some other early medieval cemeteries, perhaps a reflection of their relatively high standard of living. 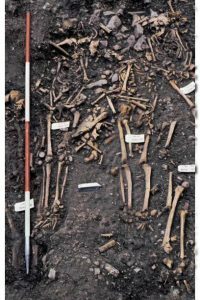 The full report is available to read on our website, and the burial information is in a database on the Archaeology Data Service. It is a site that all those involved will never forget.